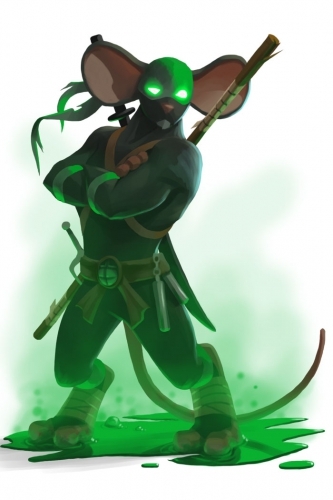 The Mutant Ninja Mouse is a breed of mouse found in the Toxic Spill, for hunters of rank Count/Countess and above. A few of Furoma's finest ninja mice seem to have been also caught off guard while training nearby. While being agile enough to avoid most of the toxins and spillage, the small amount they were exposed to looks to have increased their body mass and speed while also providing excellent nightvision! The piles of old clothing scraps near the spill location ended up absorbing the sludge, turning them green, which they quickly adopted as their new uniform. With the added strength and agility, they are also able to keep multiple weapons handy on them at all times, such as chainsticks, long staffs, prong-shaped metal batons, and short swords. Even after discovering the secret of the ooze and gaining new powers, they are still humble warriors who never forget the wise words of their master: "Remember who you are." Mutant Ninja mice are especially attracted to Rancid Radioactive Blue cheese, to the point that any other kind of cheese will simply not suffice. Hydro type traps such as Oasis Water Node Trap or Phantasmic Oasis Trap are effective against the Mutant Ninja Mouse. The Mutant Ninja Mouse drops the Toxic Spill Egg during the annual Spring Egg Hunt. The name, weapons and turtle shell belt buckle of the Mutant Ninja Mouse, and the quote "Remember who you are" in the description, are references to the Teenage Mutant Ninja Turtles. This page was last edited on 5 October 2017, at 15:43.